I just made 2 winter hats for 2 little girls. One for my neighbor & the other for my friend niece. I do not have a pattern for that. I call them "tube" hats. Very easy to make. Just crochet a rectangle, sew shorter sides together, gather on one side and put a pom-pom on it. I made that using RHSS yarn & light pink baby yarn (thin) together. 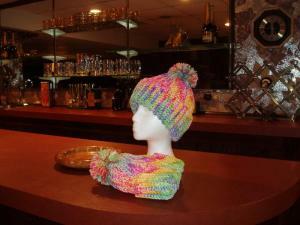 When my GD were younger I made the same hats for them using the same yarns. I had some of that yarn left so I decided to use that up. I still have some left LOL. The hats are great looking and love the cheerful colors. The style fits right in with todays popular look too. Thanks for the explanation. I use to make them too! Love your colors! Those colors they are a lot nicer in reality. I had to take those pictures in my basement (no sun-day light). For the past couple days I am living downstairs because my hardwood floors were refinished and I find out that I have an allergy to those chemicals:(. I been keeping all my windows opened day & night and my fans on..I know that is not very safe:(. I think that style of those hats is probably "forever look" LOL. You definitely should try making that hat. You will be very pleased:). They are very comfortable, they can be pull down more to cover their faces in case of very cold weather. And they stay on heads very securely, they do not slide down or up. Those hats have many years of use. Kids do not outgrow them. That stitch (back loops sc) stretches like "accordion". Same hats can fit 7 year old and adult. Here is a funny story I think I need to tell about those tube hats. 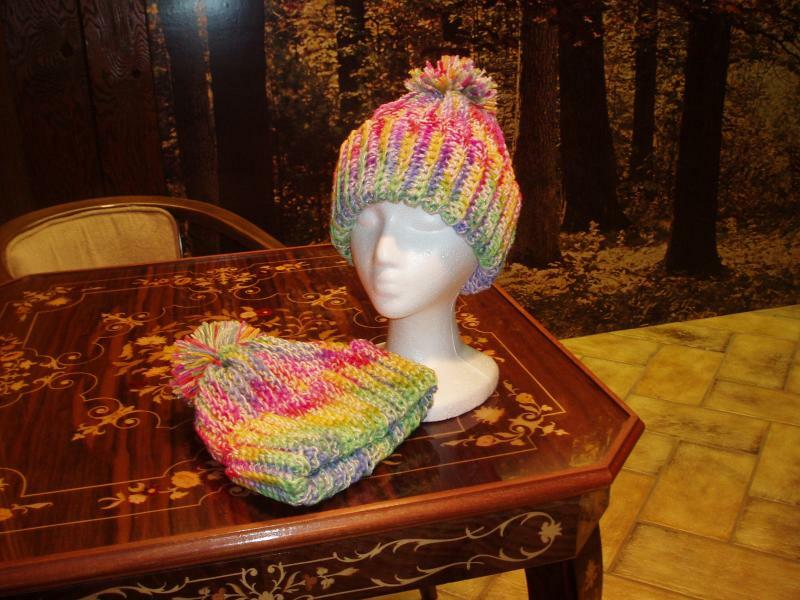 When my granddaughters were younger I made many sets of those hats for them. One winter day my son in law went outside to remove the snow. When my daughter looked out the window she started laughing, she could not believed what she was seeing..There was my son in law siding on his tractor wearing one of those hats, that was the one with beads. She went outside laughing asking him: WHAT are you wearing on your head?? LOL. He said it was cold and he just grabbed that on the way out (they lived in Wisconsin - very cold winters). Now, just try to imagine a grown man an attorney who is over 6" ft tall wearing that hat?? LOL. I told her she should taken a picture of him! . Pretty hats, the yarn you used is lovely. Gorgeous hats!! I love the colors in the yarn!